This is the first in the #mirrorofeternity series. It is a collection of short stories. 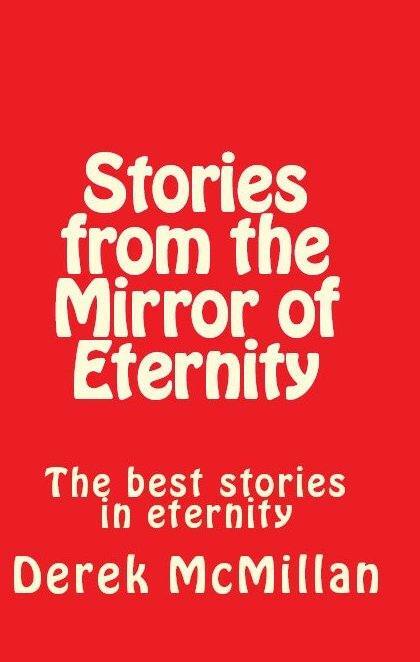 In the Mirror of Eternity – This is the first #mirrorofeternity story. It is dangerous to meddle in the past and perhaps even to observe it. Jack London's Suicide Note – a fictitious exploration of the controversy surrounding Jack London's untimely death at the age of 40. The Library – an encounter between two very different characters in cyberspace. These days libraries have computers and you can meet all sorts of people online. Der Der, Der Der – the first Virginia Monologue story. Be warned, she might be quite amusing on the page but give her a wide berth in real life! Paradox – Another adventure in cyberspace. The original story even had screenshots from a Commodore 64 but these have been sacrificed as the C64 now seems even more dated than I am. Here be dragons – a story which explores the possibilities of travel in time and space. The 'dragon' in question may come as a surprise. After Spartacus – Spartacus could be regarded as the first socialist – he thought the liberation of the oppressed was a job they could not leave to someone else. The Cross did become a symbol of Rome, but not in the way the Romans of the time imagined it would. The SS Dagger – using the Mirror of Eternity to solve a murder in Nazi Germany produces an unexpected ending. League of St George – a harmless drinking club celebrating the myth of St George hides something far more sinister. The Stalker - I read the tabloid headlines most mornings. If the economy is going down the pan, they will have a headline about Big Brother. If the prime minister is at the centre of a scandal, EastEnders will be the big issue of the day. And I wonder exactly what the truth is behind their celebrity stories. Virginia Monologue – the second Victoria Monologue story sees her talking to a friend who does not seem to be responding. Dramatoes - Childish pronunciation is always endearing. This story grew out of the way my son pronounced “dominoes”. Omar - This story is based on a personal experience when my wife and I were in Tunisia. I can tell you in advance that the ending was somewhat different in our case but that is all I will tell you before you read it. The Inspector called - A story about a school inspector. You will have guessed by now that I was a teacher once upon a time and they drove me up the wall. Bear with me. Schadenfreude - The borderland between waking and sleeping is a strange and sometimes frightening place. It is just as well it is 'all in the mind' isn't it? The Hitch-hiker - “Don't take lifts from strangers” is all very well. But don't forget the hitch-hiker is a stranger too. Stations of the Cross - I never “really” believed my father was dead. It was only later, much later, that I realised he wasn't dead. Not as long as he was remembered. The Tower of the Moon - A romantic tryst with a twist. When I think about you - This story has been rejected by magazines as “too shocking”. So either read it and prepare to be shocked or give it a miss!